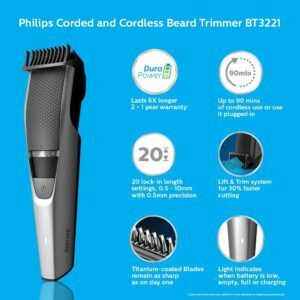 Philips DuraPower BT3221 Review – The best Cordless and Corded Trimmer? Philips recently launched 7 new trimmers in the Indian market. One of those trimmers was the Philips BT3221/15. Here, we will do a full review of the Philips DuraPower BT3221, including its features, pros, cons, and also compare it with similar trimmers. Is the Philips BT3221 better than the Philips QT4011? Verdict – Should you buy the Philips BT3221? Can you trim your beard with the Philips BT3221 when it is wet? Is the Philips BT3221 waterproof? How much warranty does the Philips BT3221 have? Will I need AA or AAA batteries for this trimmer? How to register your BT3221 for additional warranty? Inside the box of the Philips BT3221, you will find only a few things. The first thing is the trimmer itself, the blades of which are protected by a plastic wrap. Obviously, you’ll need to remove the wrap before you can start using the trimmer. The second thing is the charger. It’s a standard 2-pin charger with universal compatibility. That means it supports a voltage range of 100-240V. That means that you can take this trimmer abroad and still charge it with the same charger. Next, you’ll find the comb that will have to be attached to the top of the trimmer to use it effectively. You will also find a small cleaning brush inside which will help you clean out trimmed hair from the head easily. The last thing that you will find inside is a travel pouch in which you can store the pouch and take it with you. However, the pouch is flimsy and of poor quality. We would recommend finding an alternative travel bag to carry the BT3221 with you. You will also find some paperwork and a user manual inside—but hardly anyone ever uses or reads it. 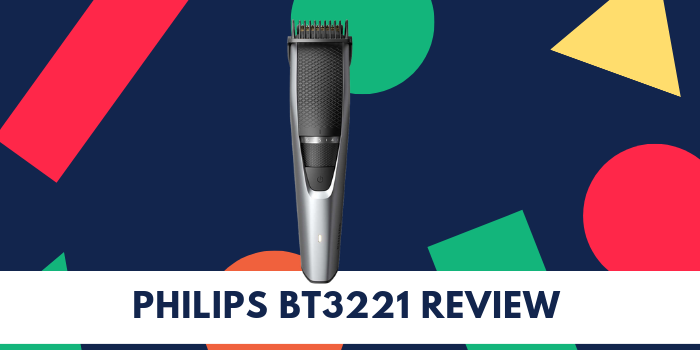 There are plenty of features in the Philips BT3221 which make it a very attractive trimmer for everyday use. The first important feature to discuss is Durapower Technology. It’s a fancy way of saying that Philips has included a battery that not only charges quickly but also lasts longer. It’s similar to the fast-charging technology that we find in modern smartphones. And the battery life is actually pretty good. The Philips BT3221’s battery charges up completely in just 1 hour and lasts close to 90 minutes on a single charge. That is one of the best battery performance on any trimmer that we’ve ever seen. The second feature is the trimming range. The Philips BT3221 has 20 lock-in settings which start at a minimum of 0.5mm and go upto 10mm with a 0.5mm jump or precision. The blades on DuraPower 3221/15 are stainless steel based and have a titanium coating on top—which makes them strong and corrosion resistant. The twin-blades are designed in a way that the blades sharpen each other while the trimmer is being used. That results in an elongated blade life which lasts many years. Similar to other trimmers, the BT3221 also features a zoom wheel for choosing your look. There are a total of 20 settings available which start at 0.5mm and go upto 10mm, each with a 0.5mm jump. You can also remove the shaving comb and use the trimmer directly on your face for a much cleaner look. Although, you will not get a clean shave look as you would get with a proper shave. Apart from the extended battery life, all these features are present in plenty of other trimmers. 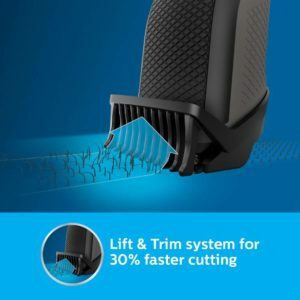 Let’s talk about some of the features that are exclusive to the new 3000 series trimmers, specifically the Philips BT3221. The first thing to know is the new lift and trim system. The new shape of the blades and comb are designed in a way such that the hair is lifted and fed to the blade. 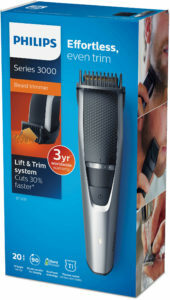 This results in faster cutting, and Philips claims that the BT32221 cuts facial hair 30% faster. Many people also reported that they get cleaner shaves and don’t have to struggle or move the trimmer multiple times on an area to get a good trim. The second thing exclusive to the new 3000 series trimmers is the corded and cordless operation. Older Philips trimmers were recommended to be used only cordlessly, not while charging, although some users still used it while charging. The new 3000 series trimmers, including the BT3221, have gotten rid of the problem altogether. Now you can use the BT3221 while it’s being charged—which makes it very convenient to use. The last important thing on the Philips BT3221 is the new battery indicator. Older trimmers only gave a battery indication when they were being charged. You couldn’t know when the battery was actually low. It was quite a bummer, and many people constantly complained about it. Finally, Philips listened and included a decent battery indicator which indicates you when the battery is low, being charged, or is fully charged. Here is how the battery notifications work. Please note that the full-battery light turns itself off in about 30 minutes. If you accidentally left your BT3221 on charging and return to see the light turned off, that means the trimmer is fully charged. Here is the complete list of features of the Philips DuraPower BT3221 at a glance. Many people have this question about the differences between the Philips BT3221 and the Philips QT4011. To be honest, there are only small differences between the trimmers. Here they are. This needs some clarification. Although both the QT4011 and the BT3221 use a Ni-MH battery with the same capacity, the Durapower technology ensures that the BT3221 holds it battery capacity for a longer period. Here the difference is clear. The Philips BT3221 has blades made of titanium while the QT4011 has stainless steel blades that are coated with titanium. Important Note: On Amazon and other shopping websites, even the BT3221 is mentioned to have to a titanium coated blade, but the official Philips website says otherwise. This is an important difference. The QT4011 only showed you an indication when the battery was being charged, while on the BT3221, you can see when the battery is low, is being charged, or is fully charged. Rest all the features of the Philips QT4011 are the same as the Philips BT3221. We have omitted the obvious design and cosmetic differences as they are obvious. Short answer, Yes. The BT3221 is superior to the QT4011 because of all the reasons we mentioned above. Considering that the price of both the trimmers is the same, we would recommend that you buy the Philips BT3221 if you were previously considering the QT4011. Absolutely. The Philips QT4011 is an excellent trimmer and the BT3221 has built on top of it to be even better at many things at the same price. According to use, the Philips QT3221 gets a full 5 stars and you should definitely purchase it. No. Any Philips trimmer, or any other trimmer for that matter, including the Philips BT3221 should not be used when your beard is wet. It may cause the machine to malfunction and may result in injury. No. The Philips BT3221 is not waterproof. However, you can detach the head and then wash it with running water to clean it. But, make sure that the head is completely dry before putting it back in the trimmer. The Philips BT3221 beard trimmer has a 3-year worldwide warranty. You get a 2-year warranty when you purchase the trimmer and then get an additional year of warranty when you register your product. You need none. The Philips BT3221 has a built-in rechargeable battery which you can charge with the charger provided. Visit this link, which will take you to the Philips website. Create an account, if you already don’t have one. After creating an account, enter your serial number in the mentioned field. You will then get an email with the extended warranty certification. Although the Philips BT3221 is an excellent value for money, some of you guys might want alternatives. Here are some great alternatives. This is another excellent trimmer which is cheaper than the BT3221. The only difference is that the BT3211 has a 60 min usage time on 60-minute charge, and it has stainless steel blades. If you’d like to save a couple of hundred bucks then you can also try the Philips BT3215. The only difference between the BT3221 and the BT3215 is that the BT3215 has a usage time of 60 minutes while the BT3221 has a usage time of 90 minutes. 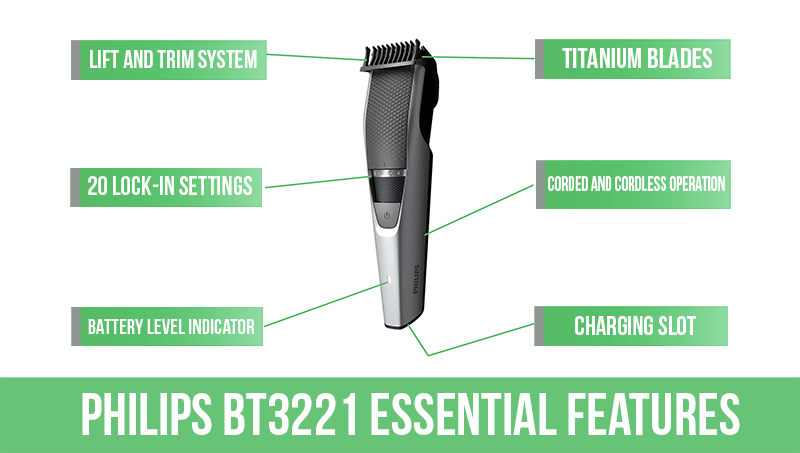 The BT3227 is almost identical to the BT3211 except that it is a full metal-based trimmer. That means the build quality of the BT3227 would be better than the BT3221. Because of the metal used, the BT3227 is also a couple of hundred rupees more expensive than the BT3221. Sadly, it’s not available online and is found at offline retailers only. If you see it being sold online, do let us know so we can update this article. Thank you. Hope you found it helpful Raghuram.